You are here: Home / Misc. / Education / What Do You Do Before High School Graduation? What Do You Do Before High School Graduation? (ThyBlackMan.com) These suggestions are to help parents, grandparents and guardians as graduation for their children gets closer. Graduation, a great accomplishment and the end to an educational journey from Day Care to High School. Before this momentous occasion parents need to make sure all the i’s are dotted and t’s crossed to make a smooth closure to a long journey. These are just a few suggestions from my experiences as a parent and teacher in elementary education and higher education. 1. Make sure you obtain the most recent high school “official” transcript to mail to schools or potential employers. Many organizations, schools and groups require a transcript to see if academically students are “qualified” to be eligible. 2. Make sure you have current and up to date medical and dental records. Even after graduating from high school students are still dependent on their parents for certain medical information. Parents must understand “their” graduate is not an adult yet, they are still maturing, learning and growing. There is some information and documentation only parents can obtain until children are 21. 3. 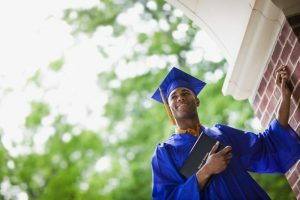 Make sure there are boundaries and expectations on behaviors, actions, and even chores in the home for the soon to be graduates. There should be mutual understanding on everyone’s duties and responsibilities and always respect. Stop telling your child they are “grown” until they are out of your house. 4. Talk to your child’s teacher(s) about consistant communication so projects, homework and assignments are kept current and get completed. Do not take the words, “I got this,” as being responsible and accountable. 5. Make any hair, nail or beauty appointments months before May to avoid the rush and chaos. 6. Remind your child of the two institutions that want their attendance Correctional (Prison) and Instructional (Higher Education) and to make wise decisions. 7. Check your child’s academic (Cumulative) folder for items that may delay graduation or entrance into college, trade school or the military. You have a right to see their records and ask questions and if not provided seek an attorney for help. Check for discipline referrals, changed grades, teacher notes, etc. All documentation is important. 8. Make sure all deposits and fees are paid in full before graduation. Check for lost books, needed forms and other items that should be completed. Do not trust your child unless they show they are responsible. 10. Make sure your child takes the SAT and the ACT several times. Many schools only require one, but better safe than sorry. 11. Check on Bright Futures scholarship information. Many HBCU’s accept ACT scores and SAT. Use whichever gives you a better chance of getting into college and this may affect monies. 12. Work on your child’s Marketable skills to help them network. 13. Set Academic, Professional, Monetary and Career goals now so your child will have a flexible plan. 16. Join local business organizations like Chamber of Commerce to gain marketable skills and get a jump on career goals. 17. Participate in church events and activities helps build your resume or CV. 18. Take college tours, visiting the school environment to make sure you are familiar with college or even the military. 19. Social Media entries; post positive content, pictures, text and video. Your e-Reputation and e-Personalities tell a story about you. Social Media content will define you and may be your first representation of you to others. 21. Continue to research educational options and inquire even now about Masters and Doctorial programs. 22. Make sure you and your child understand what type of diploma they will have. It is painful to expect a High School Diploma and receive a Certificate of Attendance, an ESE Diploma or others. 23. On Social Media unfriend and even block those that are openly using drugs openly, weapons and involved in criminal actions. You may be guilty by association with them. 24. Have a “real” Social Security card, and Birth Certificate, and if necessary a Visa to travel abroad. 25. Check with your local police department to make sure there are no records of mistaken criminal activity from someone impersonating you or looks like you. 26. Financial Aid and Scholarship Information can be found online. https://twitter.com/prepforcollege – @prepforcollege (Twitter) #CollegeChat. 27. Google and Hashtag yourself to “see” what is online about yourself to be prepared for questions.